Nearly 100 social workers, professors, and students from Norway, Slovenia, South Africa, and across the U.S. are on campus June 14 and 15 for the first international social work conference sponsored by Augsburg. 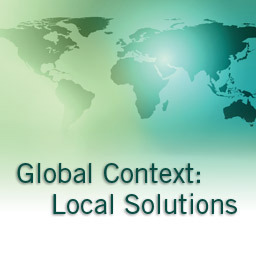 The program, titled "Global Context: Local Solutions" allows participants to gain a greater awareness of how social work is practiced in other countries. Lois Bosch, associate professor and director of Augsburg's master of social work program, said the idea for the conference evolved out of the work of the social work international curriculum committee. "The conference is a way to engage with our international partners from Slovenia and Norway." Bosch said the committee was surprised at the level of interest both from the international partners and from other social workers around the globe. The Augsburg Department of Social Work has worked with programs in Slovenia and Norway for several years. Since 1994, Augsburg has had an international partnership with the University of Ljubljana in Slovenia to develop faculty and student exchanges. In addition, the College's international partners program, in operation for 15 years, allows Norwegian students to receive part of their education at Augsburg and Augsburg students to earn academic credit at partner schools abroad. The conference will host nearly 100 participants including more than 45 presenters who will deliver plenary and breakout sessions on the social work profession, curriculum development, community development, clinical and macro practices, and research. Rosemary Link, former professor of social work at Augsburg College will give the opening keynote address. The program agenda and additional information about the conference is available on the Social Work Department website.